Keep your friends close and your enemies closer. Good advice. Especially when that enemy is new words. :lol” So, here it is, another Wednesday and I’m finally getting some new words tippety-typed onto the blank screen that used to be my monitor. 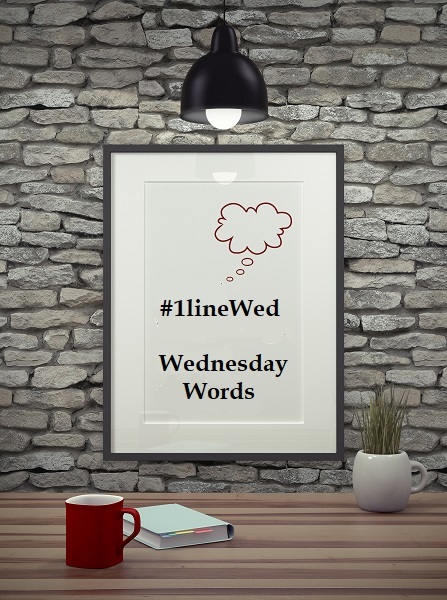 Sadly, though, I had no current words for the #1lineWed THEME of **ENEMY**. I have some newish words, though. From the next Penumbra Papers novel. I need to get back into Sinjen’s head soon. It’s almost as interesting a place to be as Sade’s. *bwahaha* This is from the opening of that book–not a prologue per se, just Sinjen reflecting on life. And death. Sade was human. She would age. Die. He was vampire. He would not change, except to grow colder, more distant. Until an enemy managed to stake him or he walked into the sun to end his existence, he would not die. They’d argued over something of no consequence, or so he’d thought. Sade didn’t think when her blood was up. And even as a Templar, he hadn’t been a saint. Sinjen could no longer remember the woman’s name. Hadn’t thought about her, especially not since meeting Sade. Granted, she was attractive, with a face and body that most men would consider beautiful. But after Sade? Women faded into the background, like so much white noise. He swirled the whiskey, watching the lights sparkle through it. He hadn’t wanted to go to that bloody restaurant in the first place. Sade had finally returned from an assignment and he hadn’t wanted to share her with the world. But she insisted. Then she stepped out to take a phone call. When she returned, that blasted woman was sitting in Sade’s chair, one hand squeezing his arm, the other his thigh, doing her best to look sultry and enticing. He hadn’t been interested. But Sade overreacted, as she occasionally did. So often he found her antics entertaining but that night? He’d been out of sorts. Missing her. Sade. Wanting to take her home to bed. The woman—what was her bloody name? His fingers tunneled through his hair and he forced his hand to return to the arm of the chair. Closing his eyes, he leaned his head back. The earth spun on its axis. He could feel the slip of time as sunrise edged ever closer. Maybe he would remain here on the balcony, looking out across the lake. He could watch the first rays of dawn without ill effect, then the lethargy of the day sleep would envelop his body. He would close his eyes, a last breath expelled from his lungs as his heart slowed and ceased beating altogether. He could sit here, watch the sun, and find some semblance of peace. But he wasn’t a coward. He rose from the chair, went inside, emptied the glass of the whiskey he could no longer enjoy. Courage, he realized, was saying goodbye to the one woman who filled his death with life, so she could live hers to the fullest. And strength was watching over her from afar to ensure she she lived it. Sade deserved her fairy tale ending. And he would never be a prince. This story goes to some dark places for both Sinjen and Sade. I can’t wait! What about y’all? Any enemy words to share? This entry was posted in Writing Life and tagged #1lineWed, characters, inspiration, musing, Penumbra, quotes, series, snippet, Wednesday Words, WIPs, writing. Bookmark the permalink. Sorry I’m late. I was in spreadsheet purgatory and then got to cleaning, more spreadsheets more cleaning. Stuffs. Getting things done I’ve left undone for too darn long, which means I’ve also gotten back to editing. Here’s to a better April for us both. Sounds like you’re off to a good start. Yay!